Reviewers really shouldn’t have a favorite film company, director, or anything like that. They should be completely unbiased and always grade each film on its individual merits. However, I will flat out admit that Disney is by far my favorite film studio, due to the incredible creativity, visuals, and family-friendly storytelling their films almost always have. Pretty much every film they release immediately goes to the top of my list of films to watch. Even the lesser films in Disney’s catalog are usually entertaining enough to be worth at least one watch. That’s pretty much the case with The Nutcracker and the Four Realms. It is one of the weaker films Disney has put out over the last few years (partially because of how good Disney films have been over that period of time), but it is still entertaining enough to be worth a watch. I would say its an average release but that is only due to the high standards Disney has. For many other studios it would be an above average release. The Nutcracker and the Four Realms is, of course, an adaptation of the classic short story The Nutcracker and the Mouse King (as well as The Nutcracker ballet that was based on that short story). However, this adaptation is significantly different than both of those titles and I would consider it only a loose adaptation at best. The Nutcracker and the Four Realms stars Mackenzie Foy as Clara Stahlbaum, a girl heartbroken over her mother’s death. It’s Christmas time and her mother set aside a gift for her before she died, which winds up being a mysterious egg with a keyhole (but no key was included in the gift). Clara’s family attends their city’s annual Christmas Eve ball hosted by the genius inventor Drosselmeyer (Morgan Freeman). When its time for gifts, Clara follows her string to a strange forest where she spots the missing key for her egg. Unfortunately, a mouse is able to get it before she can grab it and she chases after it. She runs into the nutcracker (Jayden Fowora-Knight), who informs her that she is now in the land of the four realms. The nutcracker guides her to the palace where she meets Sugar Plum (Keira Knightley) and the other leaders of the realms. Clara also learns that her mother was the one that created this land and gave its citizens life. Unfortunately, three of the realms are currently at war with the Land of Amusements lead by Mother Ginger (Helen Mirren). The three realms need Clara’s key to make more soldiers to defend itself from Mother Ginger so she sets out to find it. The Nutcracker and the Four Realms was not very well liked by critics (35% on Rotten Tomatoes at the time this post was published) or audiences (a 5.5 on IMDB and it barely made back its budget at the box office). I too will say that the film was a bit of a disappointment, but only because it isn’t as entertaining as Disney films usually are. Even though there are definitely some problems with the film, it also has some significant positives as well. The Nutcracker and the Four Realms is far from the disaster you would think it is if you looked at the first few reviews on IMDB or Rotten Tomatoes. It just isn’t a classic or an absolute must-watch. Since I’m a positive person, I first will take a look at all of the good things The Nutcracker and the Four Realms has going for it. First of all, there are some moments of incredible creativity in this film. I do wish the film would have spent some more time on the worldbuilding (as its one of the best parts of the film) but there are still some highlights here. The biggest one is the Land of Amusements, which is basically a Tim Burton fever dream come to life. This area will add even more Disney nightmare fuel to your dreams and is freaky beyond belief. From the nesting doll clowns (amazing idea but also something that may haunt your dreams after watching this film) to Mother Ginger’s creepy motorized base, there is a lot of creativity here. The only problem is these scenes may frighten small children and even make some adults keep their lights on at night for a few days. I just wish the creativity spent on the Land of Amusements (as well as the lovely costumes) would have continued throughout the rest of the film. Unfortunately, the filmmakers clearly didn’t think that worldbuilding was a priority in this film as they only seemed to care about the look of the fourth realm and the palace (the land of flowers and the land of snowflakes are barely even in the movie). It doesn’t help that the film is so short (just 99 minutes, way shorter than your usual non-animated Disney film), which doesn’t allow for much time to show off the world. Also a positive, The Nutcracker and the Four Realms has a pretty well-known cast which includes such luminaries as Helen Mirren, Morgan Freeman, and Keira Knightley. While Mirren and Freeman have small (though important) roles and aren’t really given the chance to shine, Knightley is quite good as Sugar Plum. She plays the role so well she was almost unrecognizable to me (especially due to her excited, sugar-high type voice she uses for the role). Mackenzie Foy is solid though unspectacular in the lead role, but much better than you would expect at her age. Ballet superstar Misty Copeland also gets the chance to shine in the one real dance number of the film (which is one of the better scenes in the movie). There’s nothing horribly wrong about The Nutcracker and the Four Realms, its just that there isn’t much to write home about either. It’s just a pretty mediocre film from a studio that rarely misses. If The Nutcracker and the Four Realms was put out by almost any other film studio, I’m guessing the reviews wouldn’t have been quite as harsh. I feel like the only reason it didn’t get the middle-of-the-road reviews it deserved was due to the higher standards people expect from Disney. There are plenty of good elements in this film, I just found myself hoping for a bit more in most areas. More worldbuilding, more ballet scenes to showcase Misty Copeland’s skills, a slightly more entertaining and funny script, more originality (the film borrows heavily from The Chronicles of Narnia, Alice in Wonderland, and bizarrely The Santa Clause 2 with the look of the tin soldiers), and so on. If the filmmakers spent a bit more time on this production and the film was longer to allow for more worldbuilding, it could have easily been more than just the average film it became. I received the Blu-ray version of The Nutcracker and the Four Realms (a 4K Ultra HD version was also released on the same day as this version). Even on Blu-ray, the film looks gorgeous. Due to the great video quality, it is sometimes almost impossible to tell which effects are practical and which are digital. That’s a mark of great video quality. When the film is at its most colorful, the movie really shines in terms of video quality. Unfortunately, due to the worldbuilding problems this is only the case through parts of the film. The rest of the scenes are a little drab and don’t showcase the video quality as much. Other than that, I have absolutely no complaints about the video quality on the Blu-ray release of The Nutcracker and the Four Realms. I can’t imagine how great the 4K Ultra HD version looks considering the high video quality the Blu-ray has. 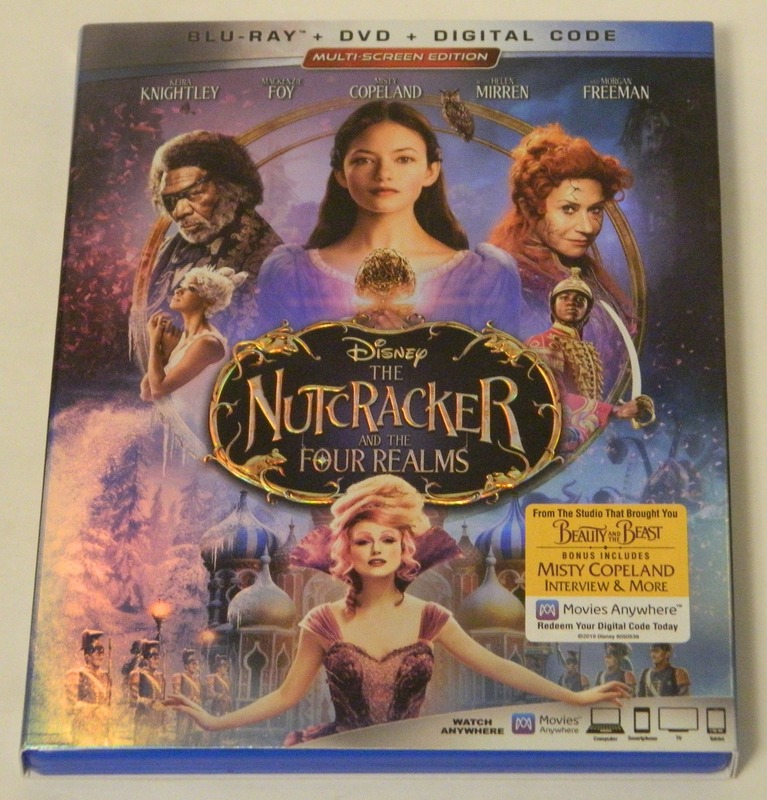 The Blu-ray version of The Nutcracker and the Four Realms also comes with a DVD and digital copy via Disney’s Movies Anywhere program. Bonus features aren’t quite as plentiful as they are on most Disney releases but there are still a few nice inclusions. On Pointe: A Conversation with Misty Copeland (4:36)-A short discussion with Copeland, the other dancers in the film, and the movie’s choreographer about how the ballet scene was made. Unwrapping The Nutcracker and the Four Realms (7:08)-Your fairly standard “making of” featurette which focuses on the color palette, sets, and costume design. Making of featurettes are usually some of the best bonus features to watch and this one is the highlight of this release. Deleted Scenes-Five short scenes that didn’t make the cut, only three of which take place in the four realms (the other two are short and dull scenes from the party). “Clara Asks About Her Mother” adds the most to the film but I can still see why it was cut. The rest are all very minor scenes if you can even call them that, “Out with the Old” is about two seconds long. “Fall on Me” (4:23)-A music video featuring Andrea and Matteo Bocelli. “The Nutcracker Suite” (4:06)-Another music video featuring scenes from the movie and music performed by pianist Lang Lang. The Nutcracker and the Four Realms is far from the terrible film you would expect it to be from reading reviews online. However, it is also very forgettable and not really a title you’ll re-watch time and time again. 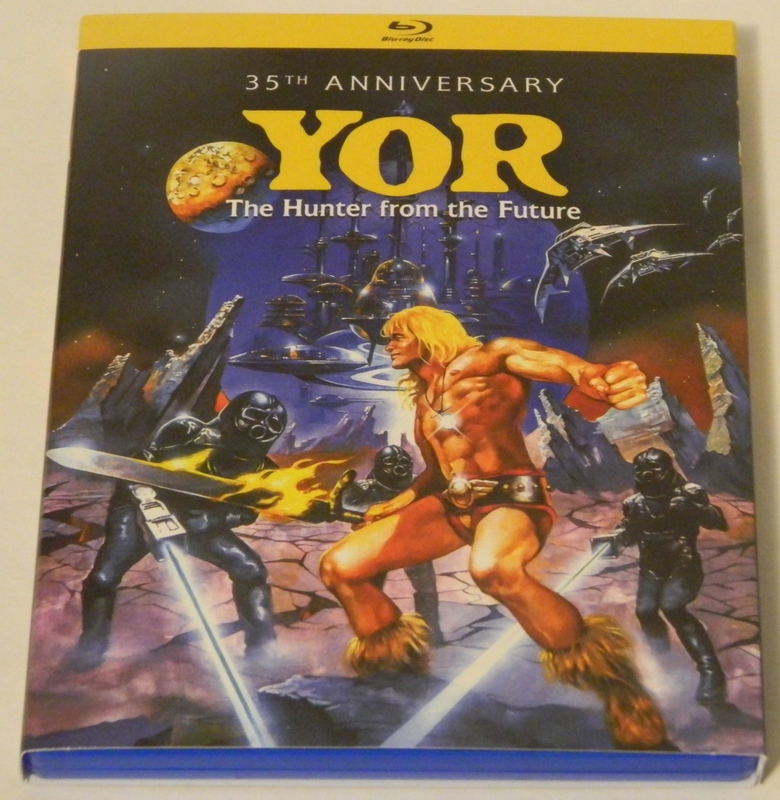 If you are a fan of the film and are planning to pick it up anyways, the Blu-ray release of the movie is great due to the phenomenal video quality and some decent bonus features. Overall, even though I feel like there was a lot of room for improvement with this film, it is still solid enough to justify at least one watch. The Nutcracker and the Four Realms was released on 4K Ultra HD, Blu-ray, DVD, and Digital on January 29, 2019. We would like to thank Walt Disney Pictures for the review copy of The Nutcracker and the Four Realms used for this review. Other than receiving the review copy we at Geeky Hobbies received no other compensation. Receiving the review copy had no impact on the content of this review or the final score. Overall, the film is completely watchable with a few standout moments here and there (the design of Land of Amusements in particular). Doesn't really stand out in many ways.